Zimbabwe Defence Forces Commander General Philip Valerio Sibanda and President Emmerson Mnangagwa (file photo). The move is reportedly aimed at addressing "current challenges where officers and non-commissioned members marry and violate the tenets of good order and military discipline". "The contravention of the Policy will see offenders being prosecuted in Terms of Paragraph 36 (scandalous conduct) of an officer and 37 (disgraceful conduct) of the First Schedule to Reference 'A' above," reads General Sibanda's statement. "The policy is to be inserted in the Adjutant General Standing Orders. The Policy is with effect from 1 February 2019. "Those who were already married to each other prior to the promulgation of this Policy are given six months from the 1 February to comply with the requirement, failure of which action will be taken in terms of Policy." 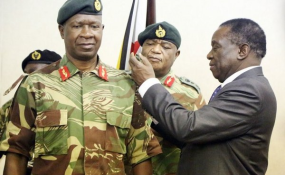 "They should decide on who should leave the organisation between each pair and each pair and names of those leaving the organisation as decided by each pair should be submitted to this HQ by 31st March 2019," said General Sibanda. "Failure to advise this HQ by 31 March 2019 on who should leave the organisation between each pair, Army HQ will assume that both partners have decided to leave and will proceed likewise to discharge both. "Take note the above deadlines only apply to those were already in marriages prior to the promulgation of this policy." "Otherwise those who will breach the policy after its promulgation will be discharged forthwith according to the policy," he added.